The CRB closed the week lower as trade becomes a growing concern. US steel/ aluminum tariffs actually commence and $30-60 Bil dollars of new US trade tariffs are rumored to be pending against China. The raw materials market has softened amid the US trade rhetoric as it could cause a slowing of world GDP – and throws real concern to the US being a reliable supplier. Trade wars are never bullish. The cost to importers/end users increase on the tariffs and sooner or later the buyers seek out other suppliers. ARC fears that US political trade debate will deepen in the weeks ahead and that retaliatory measures will be seen as damaging to demand. It will be key that the Trump Administration pivots on its pending restrictive trade legislation that allows world raw material demand to grow. The weeks ahead are all about trade and whether NAFTA can be renegotiated in a timely fashion. May corn fell 6 cents, and ended lower for the first time since mid-January. Argentina’s drought has been mostly digested, particularly as private estimates are now centered at 30-32 MMTs (which is reasonable given historical dryness), and fund length is paring pared slightly. Focus is shifting to the Northern Hemisphere, where weather outside of the US Southern & Western Plains has been largely favorable, and also there’s no sign that Brazil’s wet season will end prior to early April at the least. Consolidation is expected over the next two weeks, but we caution against turning bearish below $3.75 basis May. US export demand is accelerating, rather than slowing, and it remains that new crop stocks will exist in a range of 1.7-1.8 Bil Bu amid steady/lower acreage and as better exports are expected to continue into the first quarter of the 18/19 crop. A new bearish trend requires confirmation of favorable US summer weather. 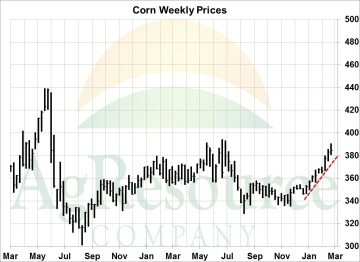 May corn fell 6 cents, and ended lower for the first time since mid-January. Argentina’s drought has been mostly digested, particularly as private estimates are now centered at 30-32 MMTs (which is reasonable given historical dryness), and fund length is paring pared slightly. Focus is shifting to the Northern Hemisphere, where weather outside of the US Southern & Western Plains has been largely favorable, and also there’s no sign that Brazil’s wet season will end prior to early April -at the least. Consolidation is expected over the next two weeks, but we caution against turning bearish below $3.75 basis May. US export demand is accelerating, rather than slowing, and it remains that new crop stocks will exist in a range of 1.7-1.8 Bil Bu amid steady/lower acreage and as large exports are expected to continue into the first quarter of the 2018/19 crop. A new bearish trend requires confirmation of favorable US summer weather. 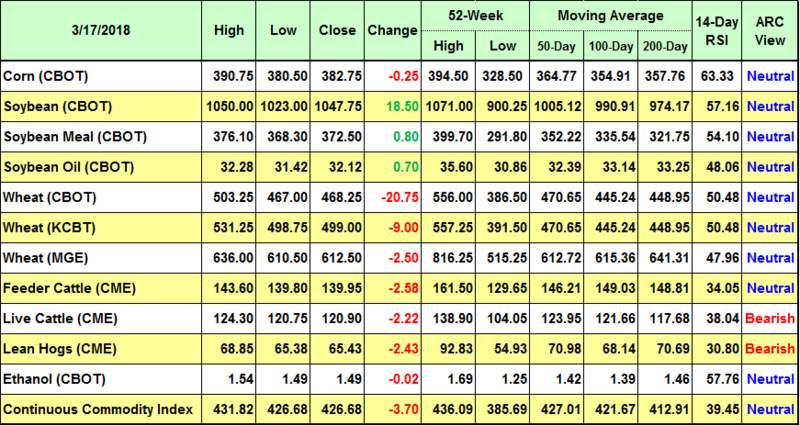 Soybeans traded back and forth through the week and were higher at Friday’s close. Argentine weather forecasts flipped from wet to dry and back to dry for the last half of the month. Technically, spot futures are still holding well above the mid February breakout, but have not been able to extend gains in the last 2 weeks. 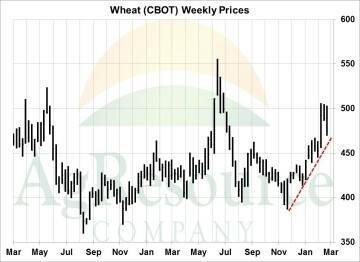 The market appears to be waiting on early Argentine crop yields, along with US new crop planting intentions to better determine whether the crop is fairly priced? The US has picked up a significant amount of export business in the last several weeks, and current sales and shipments are now starting to align with the USDA’s export forecast. 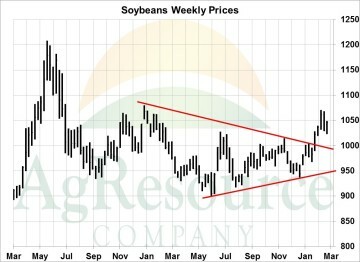 We look for the market to hold in a broad range into the end of the month when planting intentions and quarter stocks data will allow traders to zero in on current and expected US soybean stocks and supplies. Cattle futures traded on both sides of unchanged through the week, bouncing back and forth between key support and resistance levels. The week’s cash business started early in the week with initial sales developing around steady at $127 in the south and up to $128 in the north. The strong cash trade and $6-7 premium basis offered support to CME futures. 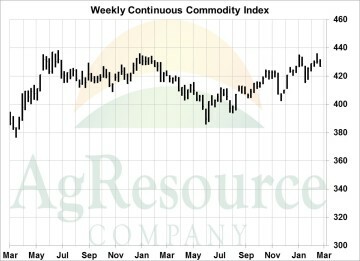 The beef cutout values held in a narrow range near steady for the week, but the upside momentum has stalled and the market looks to be confirming an initial spring high. Going forward, fed cattle supplies will steadily increase into the summer, which looks to slow rallies in the beef market. 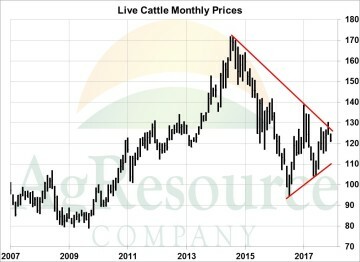 CME cattle futures marked a seasonal top with the February expiration, and our view is that the cash market is in the process of doing the same. AgResource’s outlook stays bearish on CME rallies with the cash to fall $15-20 into the midsummer. 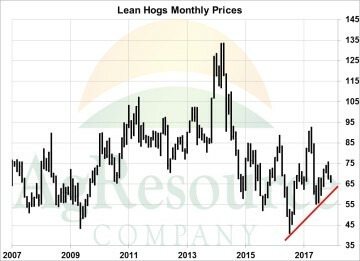 It was a mixed week of trade in the hog market, with April hogs sliding to new lows amid weaker cash markets, while summer hog futures traded higher on ideas that the cash market is close to forging it’s seasonal low. Fundamentally, hog slaughter rates are holding at record levels, while carcass weights have averaged close to 2 Lbs heavier than a year ago. There is no shortage of pork for the US marketplace. Demand has turned seasonally slow and does not appear to be keeping pace with the supply increase. Pork prices have slipped back near the 4th quarter lows. However, the coming Easter holiday should produce a sharp draw down in ham stocks, followed by summer grilling demand. The cash hog market is expected to forge a seasonal low just under $65, followed by firming trends into the summer. However, record supplies look to stop the seasonal rally at $80-85.